The “Fight of the Century” is here and will be on PPV this Saturday. 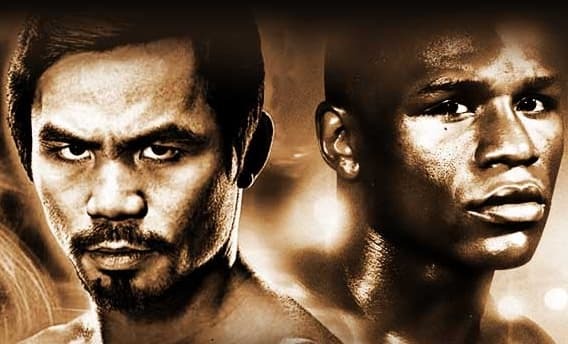 Floyd Mayweather 47-0-0 (26 KO’s) is favored to beat Manny Pacquiao 57-5-2 (38 KO’s). There are really only two likely outcomes in this fight. Mayweather will utilize his defense and size advantage to win by decision or Pacquiao will outwork his opponent and connect with power shots. The best price on Floyd Mayweather in the USA is at TopBet. If you reside outside of the USA, Bwin has Mayweather priced at – easily the best odds you’ll find on Money Mayweather. New bettors at Paddy Power will get 4/1 5.00 +400 4.00 4.00 -0.25 odds on Mayweather or 9/1 10.00 +900 9.00 9.00 -0.11 odds on Pacquiao, but the maximum bet is £10 at these odds. It’s a great offer to take advantage of. The best price on Pacquiao is 37/20 2.85 +185 1.85 1.85 -0.54 at GTBets for American bettors. For those outside of the USA, you can get 21/10 3.10 +210 2.10 2.10 -0.48 on Pacquiao to win at Boyle Sports. You won’t find better lines than these two. A draw is extremely unlikely and I’ve considered betting on Mayweather (Bwin) and Pacquiao 21/10 3.10 +210 2.10 2.10 -0.48 (Boyle Sports), which would provide a 3.18% ROI as long as the fight doesn’t end in a draw. I’ve looked at many angles and I keep coming back to Mayweather winning by decision. Mayweather hasn’t won by KO since 2011 against Victor Ortiz – he has since won five decisions in a row. Some bettors are worried about Mayweather slowing down recently. However, I believe he has just become more efficient. His punches thrown numbers are down, but his accuracy is up. Pacquiao had a rough 2012, as he lost to Timothy Bradley (SD) and Juan Marquez (KO). However, he has bounced back with three decision wins against Brandon Rios, Timothy Bradley and Chris Algieri. Pacquiao has looked good during his recent 3-fight winning streak. He has averaged 674 punches thrown and 236 punches landed. His accuracy has taken a dip dating back to 2011. Mayweather needs to open up with a few strong rounds. He can’t allow Pacquiao to build momentum and win rounds early in this fight. He also has to make sure he doesn’t get caught up on the ropes. There’s some concern over how many punches Mayweather has eaten lately as well. Pacquiao has more power than any of Mayweather’s recent opponents and he can’t afford eating 200+ punches. With the fight being in Vegas – I’m sure Mayweather will receive some preferential treatment from the referees and judges if the fight ends up going to the judges’ scorecards. I’m also betting on the Mayweather punches landed % prop. I’m betting on Mayweather landing over 40.5% of his punches – a feat he has accomplished in his last four fights dating back to 2013. Mayweather needs to be calculated in his attack and rely on his exceptional defense. I don’t expect him to throw many bombs and he should be accurate enough to hit this prop bet. Pacquiao has improved his defense, but he still telegraphs a lot of his punches and that causes his some problem. The one thing Pacquiao has going for him is the fact he’s a southpaw. Mayweather has had some trouble against southpaw boxers in the past, but he’s going to be ready for war and he’s not going to want to have his perfect record ruined with a loss to his biggest rival.